An eye-opening examination of four legal cases concerning genetically modified seeds in Saskatchewan and Mississippi, using the lens of political economy to make crucial connections between sociological repercussions and legal proceedings involving Monsanto, the leading producer of genetically engineered seed. Biotechnology crop production area increased from 1.7 million hectares to 148 million hectares worldwide between 1996 to 2010. While genetically modified food is a contentious issue, the debates are usually limited to health and environmental concerns, ignoring the broader questions of social control that arise when food production methods become corporate-owned intellectual property. 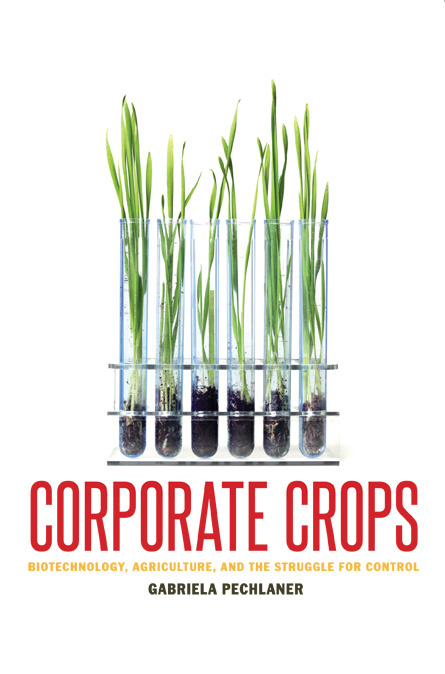 Drawing on legal documents and dozens of interviews with farmers and other stakeholders, Corporate Crops covers four case studies based around litigation between biotechnology corporations and farmers. Pechlaner investigates the extent to which the proprietary aspects of biotechnologies—from patents on seeds to a plethora of new rules and contractual obligations associated with the technologies—are reorganizing crop production. The lawsuits include patent infringement litigation launched by Monsanto against a Saskatchewan canola farmer who, in turn, claimed his crops had been involuntarily contaminated by the company’s GM technology; a class action application by two Saskatchewan organic canola farmers launched against Monsanto and Aventis (later Bayer) for the loss of their organic market due to contamination with GMOs; and two cases in Mississippi in which Monsanto sued farmers for saving seeds containing its patented GM technology. Pechlaner argues that well-funded corporate lawyers have a decided advantage over independent farmers in the courts and in creating new forms of power and control in agricultural production. Corporate Crops demonstrates the effects of this intersection between the courts and the fields where profits, not just a food supply, are reaped. Chapter 3. Biotechnology on the Prairies: The Rise of Canola . . .
Gabriela Pechlaner is a sociology faculty member at the University of Fraser Valley in Abbotsford, British Columbia. Her research has appeared in numerous scholarly journals, including Anthropologica , Rural Sociology , and Canadian Journal of Sociology .